In today’s industry, data is crucial. How you collect it, use it, analyse, organize and even manage information, are just as important as the data you collect itself. This is why more businesses are turning from their paper forms and other traditional forms of data collection (phone calls), to well, online forms. We’ve previously compared the use of online forms to traditional data collection processes like paper forms, overly complex processes like software apps and then even listed reasons why you should use Formplus for data collection as well as made a list of the top 20 online form builders. This article is a little bit different from those ones in that we are pitting Formplus against the super popular Google Forms. 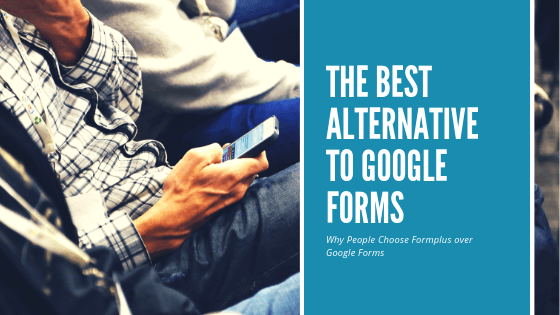 Both are amazing Form Builders but; we would be highlighting why you should pick Formplus is a better alternative to Google Forms. Yes, we are sure you’ll also see reasons once when we are done. Formplus started out as a simple file upload tool and has gone on to become a robust data collection app for thousands of users. It is touted as a great alternative to Google Forms and as you will see by the end of this article, it’s a lot more advanced yet so simple. Formplus and Google Forms - have some similarities (obviously they’re both form builders) but, in a number of ways, they have a lot of differences. From creating forms that can be signed online to having forms that can be filled at a convenient time to getting the location of your respondent, Formplus is a simple but powerful online form builder that is designed to help you collect important information from those that matter. This could be your clients, teammates, employees, students, suppliers, donors, volunteers and much more. Online forms find their expression in different industries like Education, Human Resources, Business, Construction, Non-Profits, etc. These forms could also be enabled for file uploads, payments, collecting online signatures, workflows, and approvals. The Formplus form builder has a mobile-first interface which makes form filling and interaction easy; you also do not need to have prior coding experience or ability to be able to build robust online forms. There are over 30 form field types to choose from and with these, you can build really simple online forms to collect payments or complex forms that work offline. Google Forms is part of the tools developed by Google majorly for collecting data in the form of surveys and forms from respondents. It was launched in 2008 and has been upgraded several times since then. Now it is no longer a basic tool for collecting responses as it is much more robust than it was when they started. The Google form builder can be used to create free online forms for customer surveys, event registrations, educational forms, contact forms, customer feedback forms etc. It has drag and drop functionality, form customization to add life to your forms through colors, images etc. It is also easy to use with various form fields such as short answer, multichoice, checkboxes, dropdown etc. Google Forms allows collaborations on forms so you and your teammates can work on online forms in real time. The forms can be also be divided into sections and pages to avoid long, boring forms for your respondents, and you can view responses in Sheets which is a major plus for organizations that use Google Apps and their services. However, Google Forms is still lacking in a number of ways from what an advanced form builder should have in place. For example, being able to collect payments online, receive files from anyone and not just signed in Gmail users, offline forms and data sync is not available in Google Forms even after so many years. This has led to the rise of some really powerful alternatives, one of which is the Formplus form builder. Why is Formplus a Better Alternative to Google Forms? Google Forms and Formplus are both very easy to use; you can play around the form builders even without any technical knowledge. The idea is, “I need this information from a set of people, I create an online form, I send it out and then I can easily view the information I need”. Straightforward, easy. They also make it easy to manage, store and organize data with the use of Google Sheets. Google Forms covers the basic features and then some still, it does not have quite as many features that Formplus has. Online Payments: A number of times, people ask if they can make payments or conduct commercial transactions using Google Forms. It’s 2019 and this is still not possible. With Formplus, online forms can be integrated with various payment gateways to help you receive payments online. These forms can help your customers/donors make payments/donations without the need to redirect them to a payment gateway. You can create different types of payment forms - Donation forms, Event registration forms, order forms, etc. Google forms, on the other hand, cannot be used to receive online payments. Save and Resume Later: Sometimes, you want your respondents to fill online forms at their own pace - if they start filling a form and then choose to continue at another time, they would not have to start filling all over again. This is possible with Formplus. If you were to create a Google Form, respondents would have to fill the forms completely because there is no feature that allows them to save form progress and then continue later. E-signatures: Formplus allows you to collect signatures online through the use of forms. The electronic signature field is so responsive and the forms can be filled on any device. This feature is not yet available in Google Forms, neither is file uploads. File Uploads: A file upload field in online forms is used to collect images, videos, documents etc. It can be added to job application forms to collect resumes, contest entry forms to collect photos and other online forms that might require the submission of a document. In Google Forms, uploading files can be a herculean task as file uploads can only be done by signed-in Gmail users. For other respondents, they can upload the files to an online directory and then share the link in the form. Offline Forms and Data Sync: You can create forms that can be filled offline and later synced with Formplus - you will only require an internet connection to sync responses to your database. Formplus forms can also be filled using SMS but Google Forms can at no point be filled offline. With this feature, Formplus forms find their use case in remote data collection. Field agents can use the forms in areas with little to no internet connection and the responses collected would be synced once they connect to the internet. Tracked Submissions: Online forms with tracked submissions help you know which of your respondents have submitted their forms and the time these forms were filled. With this, you can send reminders to prompt them to fill the form or if you're using this to monitor team progress, you can just note this down. Google Forms is yet to have this as one of their offerings. Pre-populate Forms: Form prefill in Formplus improves accuracy and saves time during the form filling process. You can create custom URLs for each respondent or send them Invite emails to complete the online form. This another function that Google Forms doesn't have. Form Templates: Online form templates give you a head start on your form building process and help you get the work done in little or no time. A number of form builders have pre-built templates to make the form building process a lot easier, and Google forms and Formplus are no different. Google forms have 15 templates that you can work with and they’re categorized under Education, Work and Personal. Now, if you don’t find a template close to what you want, you may have to build yours from scratch. Besides, it’s been a while since those form templates were updated in design. On the other hand, Formplus gives you access to over 30 templates categorized by Industries as well as specific features such as educational forms, for industries, non-profit organizations and so much you will inadvertently find the one that fits like a glove. The probability of not finding a template close to what you want is like, 0.5%( just kidding, but not kidding). These templates can be edited, customized and styled to be more on-brand with your specifications or made better for you. Secure Forms: All Formplus forms are GDPR compliant just like Google forms. However, Formplus adds an extra layer of security on the forms with CAPTCHA to keep them safe from scammers and bots. You can as well collect secured encrypted data with SSL enabled on Formplus forms. Workflows and Approvals: With Formplus, you can create automate the monotonous task by attaching workflows to your forms and you can allow other team members to review and approve submissions. This helps you to save time and be more productive. Other features that Formplus users find really cool to use include Formplus URL shortener(since goo.gl is shutting down soon), Autoresponder emails, and so much more. With all said and done, it is now time for you take action and let your online forms do all the work while you move ahead with other important processes. Amp up your form building and data collection process by signing up for a free 21-day trial of Formplus. Get started now!